It is easy to forget, and many refuse to remember. To understand now, look back, then. Very powerful photograph, lots to think of. I'm guilty, I actually forgot. The date, not the event. Being outside of SA for so long, you tend to get caught up in day to day busyness. Thanks for the reminder... it puts things in perspective. We are reeling here from the long-awaited Inquiry report on Bloody Sunday. Like Karen says, shameful - and yet there's been such progress (Ireland). We mustn't forget either of those things. Thank you for posting this. Myself and the Bolivianas have just had a history lesson. We are saddened yet as ever marvel at the courage of those who blazed (literally) the trail. We're remembering what June 16 means by standing behind our soccer team as a nation. Do you even know who we're playing, or which stadium we're at? The past is important, but so is where we are today. It's good that you remember Peterson, but do you know who Mokoena, Tshabalala and Pienaar are? Worse than those who refuse to remember, are those who refuse to look forward. K Milford - really don't know what to say to you. Sure, I know the name of some rugby and some soccer players, but I am not really a sports fan. Your point is...what exactly? I don't 'look forward' because I don't write about sport? Curious about why this touched a nerve but I'll probably never find out...when I think of all the boere herdenkinge - ossewa this, trek that - that I had to live through,and study in our 'history' classes, why is this day not significant? My own point was simply that many people who complain about some aspects South African life now, refuse to connect the dots all the way to the past. Which was not very long ago and whose effect is felt in the lives of generations of people. I was in a socially conscious family so I remember well the news of this day. 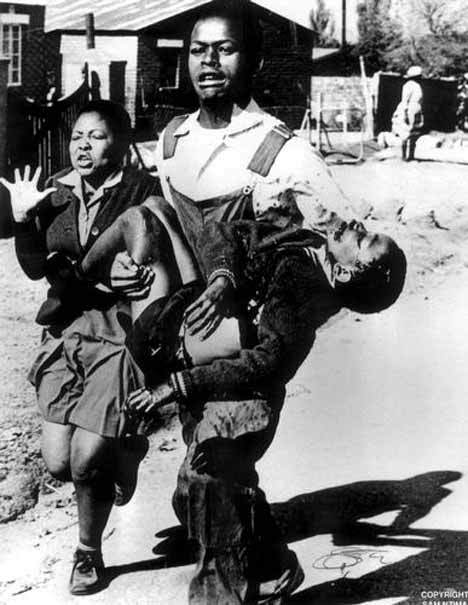 Not so immediate for us in the US, I would have no idea of the date... but many around the world felt the pain of the oppressed and were ashamed of the economic and military support our country gave to apartheid. Of course our own US history is one reason for many of the continuing troubles in this country. Yes, there has been progress but it may be fragile. A lesson we should be learning everywhere is that we need not only legal civil rights for all, we need a moral economy. The oppressed make advances in times of prosperity; in times of fear we retreat to concern for our own "tribe". I will never understand why so many of us can't seem to admit that other people -- those we have differences with, don't agree with, whatever -- have feelings too. That they bleed like we do, have pain like we do, love their friends and family as we do. Perhaps we don't agree with them politically or socially, but bottom line is that we are all humans. We know sadness and tragedy and loss, and it hurts just the same, no matter the color of our skin or the name on the church we do (or don't) go to. This photograph is so moving.